Coolpctips.com Official Partner Brothersoft is offering a wonderful giveaway today for the apple gadget lovers. As we all know that apple products are getting very popular now a days. People are showing a lot of interest to buy the products like iPad, iPod, iPhone and Apple TV. Most of the audio or video files which we play in our apple products wont support good enough. At that time we really need a good converter. Luckily today Brothersoft is linked up with Apple video converter to give us a cool Apple Video Converter Factory Pro which is worth 30$. 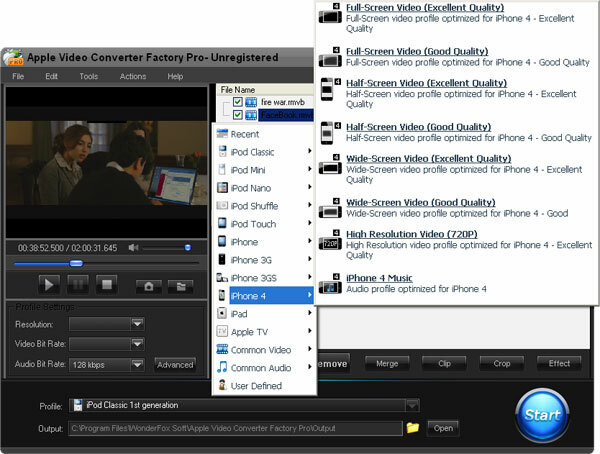 Apple Video Converter Factory Pro is a all in one video converter which can convert all popular videos formats of iPad, iPod, iPhone and Apple TV. Its very easy to use, all you have to do is to select your apple device and click on start button to start the conversion. All you have to do it to Click the below link and follow the other link to enter your name and email to get a free key instantly.Remember that the username for the giveaway will be Brothersoft and the free key will be the key which you will receive to your inbox after registration. The give will be closed on 15/4/2011. That`s the biggest problem we have had with apple products. Thanks to brothersoft it is going get solved. The speed of feedback is pretty fast! I ‘ve got the active coding. The apple converter is great! The biggest advantage of this software is the fast speed and some spcial design scheme for Apple device.Other function are almost the same. But I think it is enough. Cool giveaway. However, i don’t have any Mac yet.